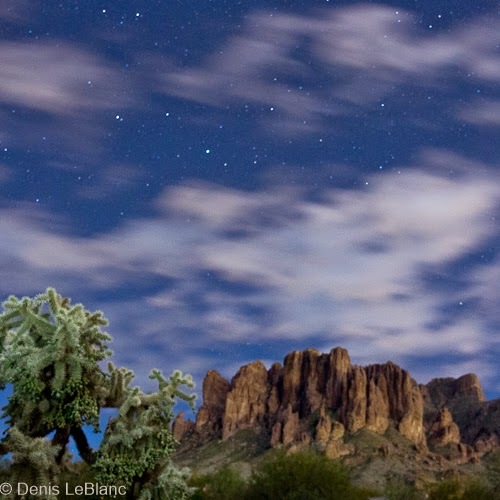 Less than an hour from the sprawl of Phoenix, the Superstition Wilderness is a gem of a mountain range. 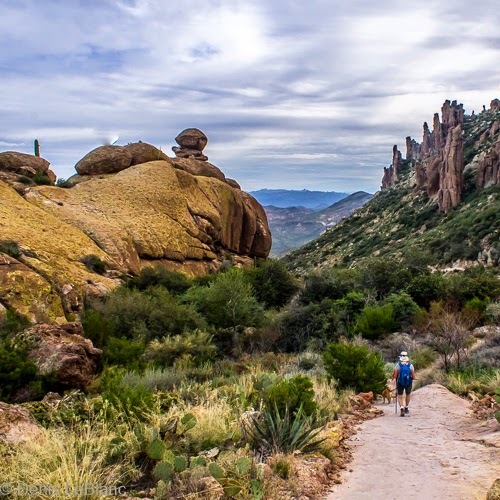 Home to numerous legends of lost gold mines, treachery, hidden caches of Jesuit Gold and fortunes won and lost, the Superstitions are a wonderful and brutally rugged wild landscape. 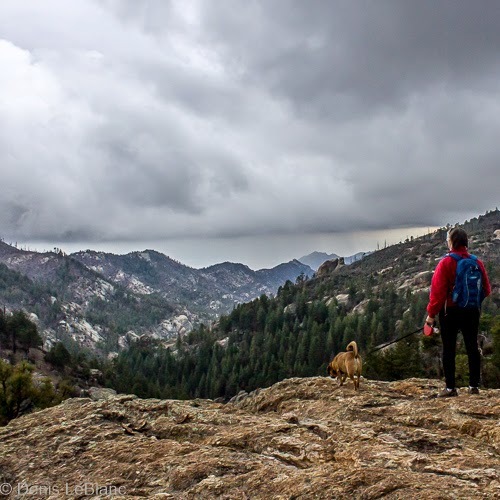 We hiked one of the most popular and scenic routes in the range, headed up Peralta Canyon to a saddle with a view of the Weaver's Needle pinnacle. 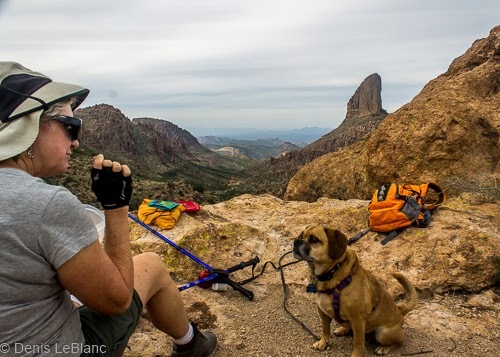 This hike was a bit of a challenge for us, but it's steady climbing ascent and gorgeous views made it the highlight of our week in Phoenix. 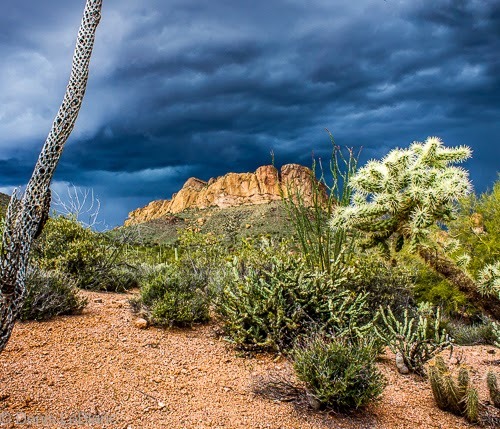 We reluctantly left Tucson, feeling that we had left many things un-done and un-seen. It seems that the more we see of this country, the bigger it gets and the more beautiful and interesting places we find that we never suspected were there. 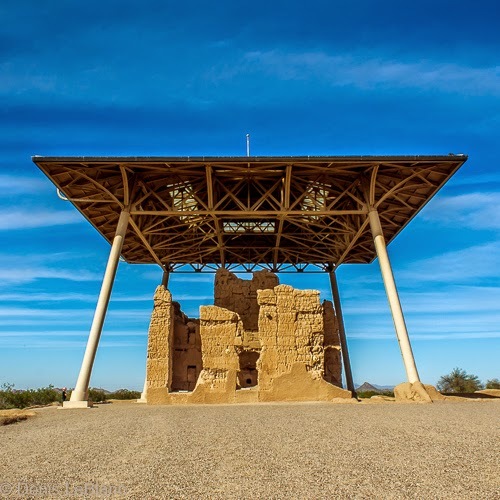 Traveling from Tucson to Phoenix we took a blue highway and passed Casa Grande National Monument and decided to stop there, knowing nothing about it. 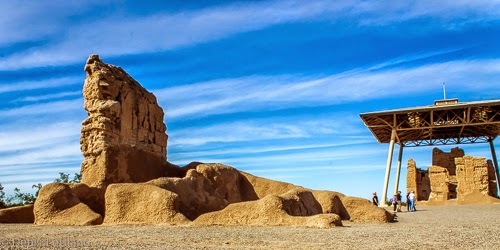 It turned out to be a terrific site to visit. 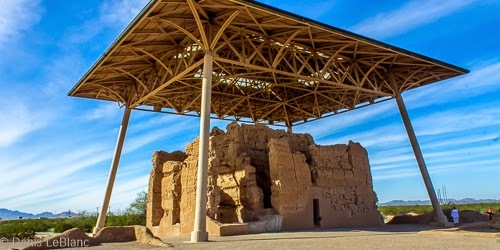 The ruins of a old settlement of the Hohokam people, built around 1400 AD are the centerpiece of this site. We spent a few hours wandering the site, taking pictures and touring the excellent visitors center. 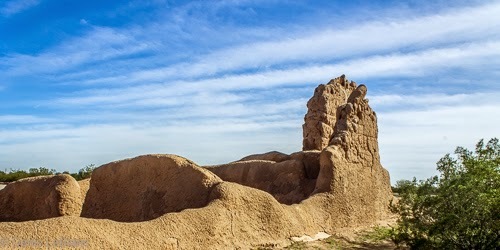 Cas Grande ruin is 700 years old. 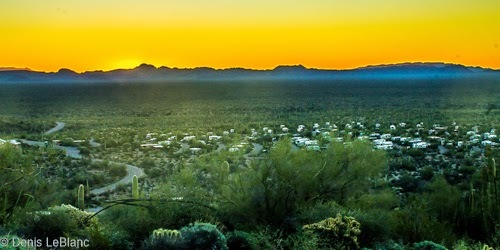 When we started this journey in 2013, we passed through Phoenix and stayed at Usery Mountain Regional Park, which we loved. 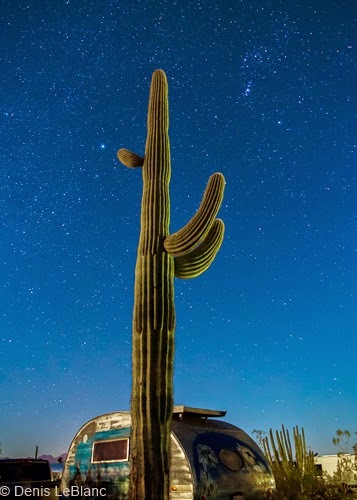 It was our first experience of the Sonoran desert and a wonderful park and campground. 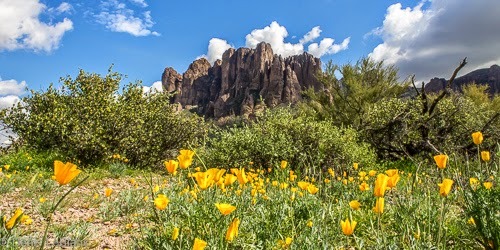 This year, we decided to try another highly-rated campground, Lost Dutchman State Park. 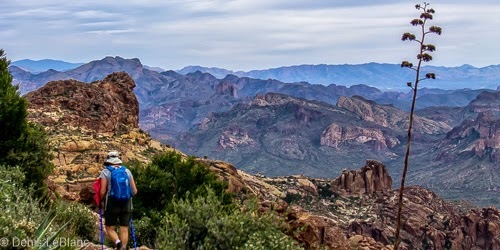 This park is further from Phoenix (about 40 miles) and was really great as well. 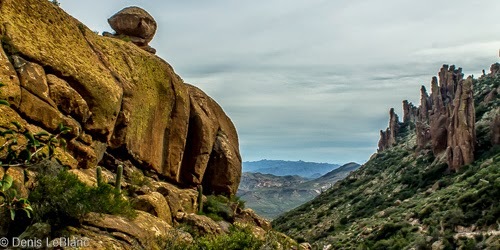 It is near the little town of Apache Junction and has a lot of things to do as well as gorgeous desert scenery. 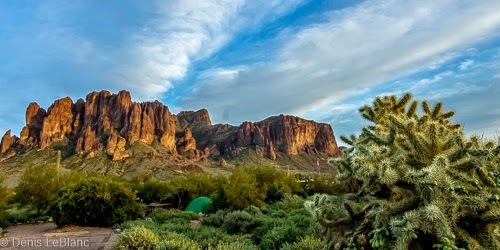 Another view from the campground. The poppies are just starting to bloom! 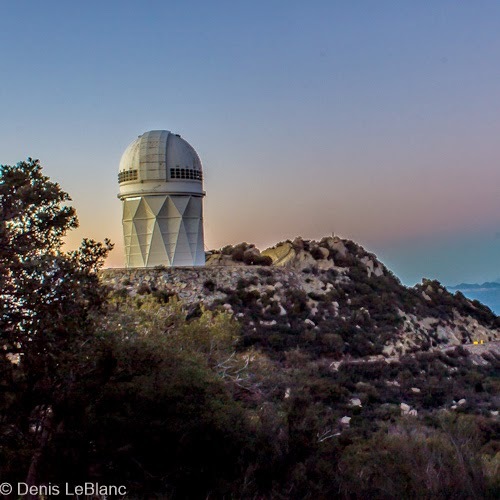 Just an hour drive from Tucson, the Kitt Peak National Observatory was something I was really looking forward to. 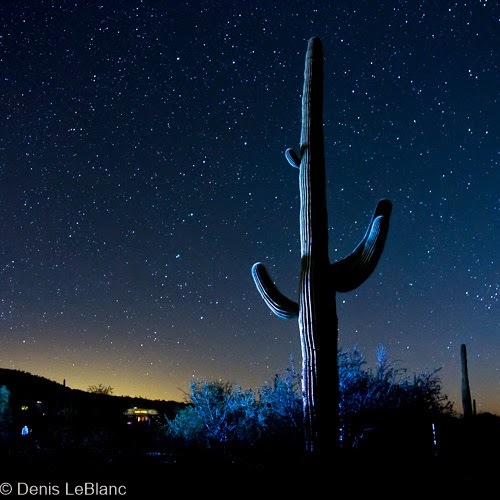 They have great evening observing programs for the public and we signed up well in advance for the night of the new moon. It turned out to one of our best spots ever! 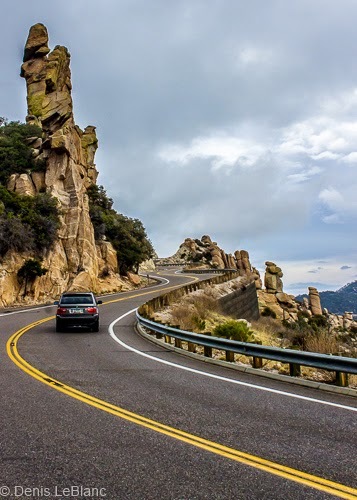 The road to the top was one great view after another. A bit chilly at 6,900 feet! 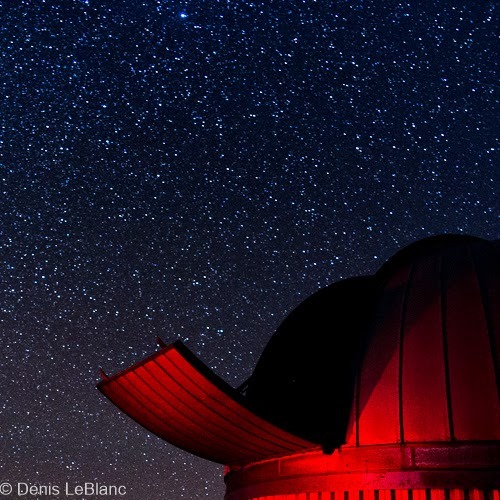 The world's largest solar telescope extends quite far underground. 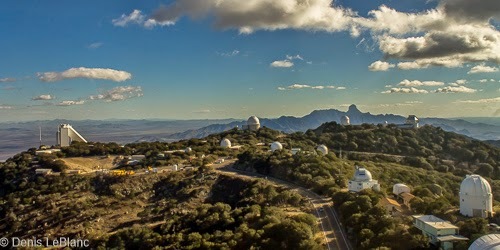 Established in the 60's during the peak of the space race with the Soviet Union, Kitt Peak has grown to house the largest collection of professional telescopes in the world, including the world's largest solar telescope and the third-largest reflecting telescope. 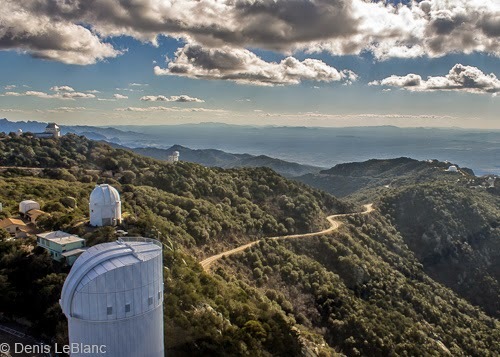 We arrived in a mad dash to get there before the closed the grounds and had about an hour to wander (more like race) around to see the 40-meter big telescope and the solar telescope before they closed to the public. We had a lot of time to spend in the visitor center waiting for it to get dark and getting our orientation. 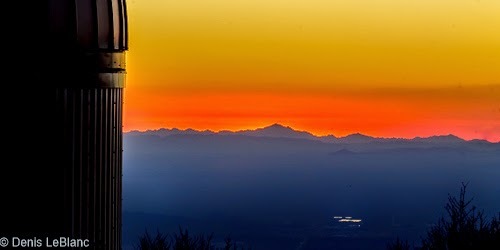 As a group, we all walked up the hill to watch the sunset from thousands of feet above the desert on a VERY clear night. After that, we split into groups and our group of 16 went with our astronomer to the observatory and more orientation. 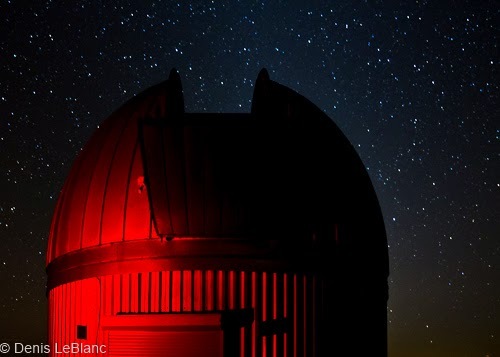 In all we spent about three hours under the most amazing sky of stars and took turns at our telescope observing Venus, Mars, Jupiter, Uranus, double and triple star systems, star clusters, planetary nebulae and galaxies. We even saw comet Lovejoy. When we weren't actually looking through the scope, we couldn't stop looking at the incredible night sky (except when we popped downstairs to warm up and get a hot drink). 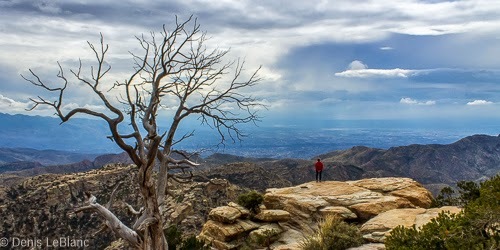 This is a must-do experience if you are ever in the Tucson area and can plan ahead. 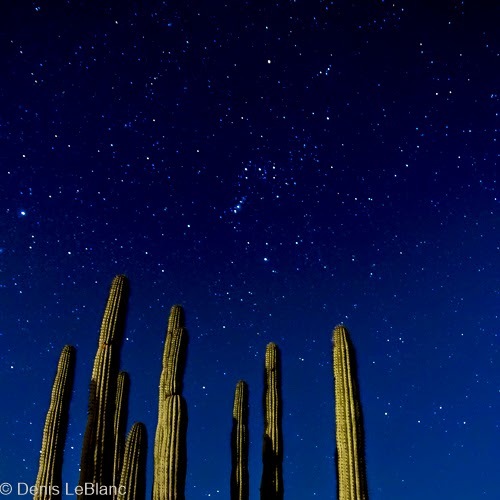 Our week in Tucson was a whirlwind of activity. 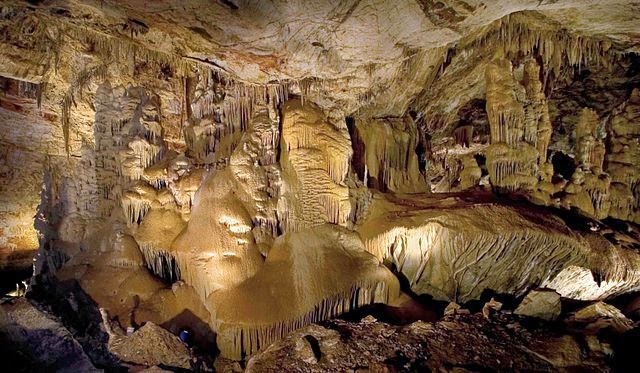 After doing the mission, the cave, Tombstone and the national park, we dove in again. First up was a scenic drive that was recommended to me by a friend on Instagram. 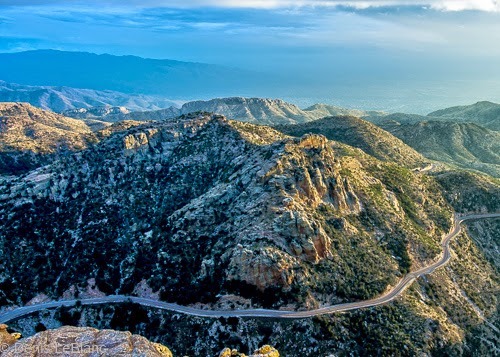 Just north of Tucson are the Catalina Mountains, which rise up 6,000 feet over the desert floor. The Mt. 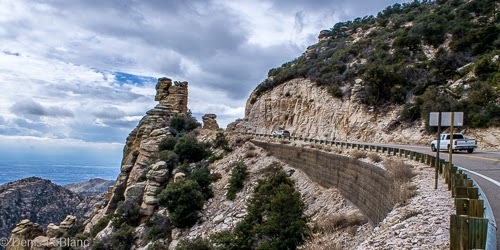 Lemmon Scenic Byway winds up to near the top in just about 27 miles. Driving this road is equivalent to driving up to Banff, Alberta in terms of the ecosystems in passes through. 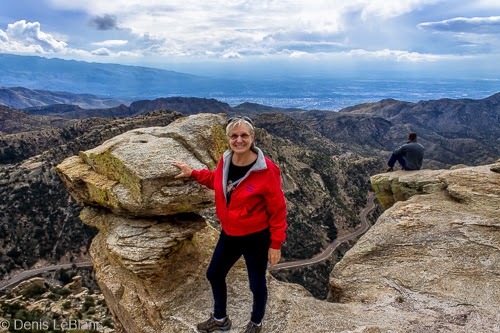 The views are fantastic and the rock formations (hoodoos) are beautiful. 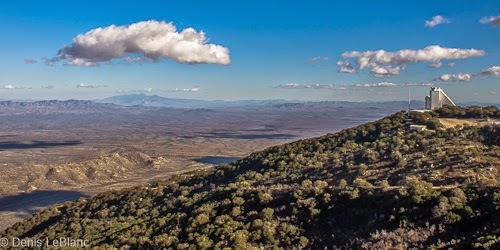 We drove to the top, hiked a few miles, then drove down to catch the sunset at Windy Point overlook, one of the most beautiful scenic vistas we've ever seen. 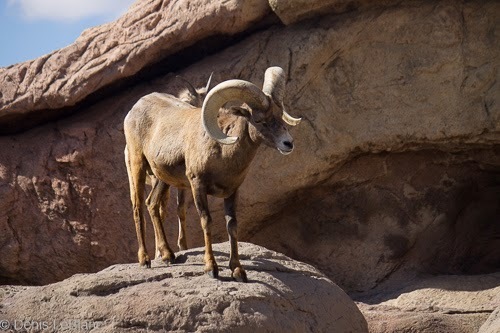 The next day, we visited the Sonoran Desert Museum, which is a combination zoo and botanical garden, similar to the Living Desert in Palm Springs. 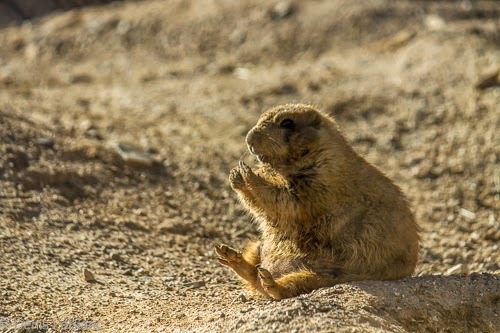 This one was much more focused on the animals and plants of southern Arizona and had us engaged all day. 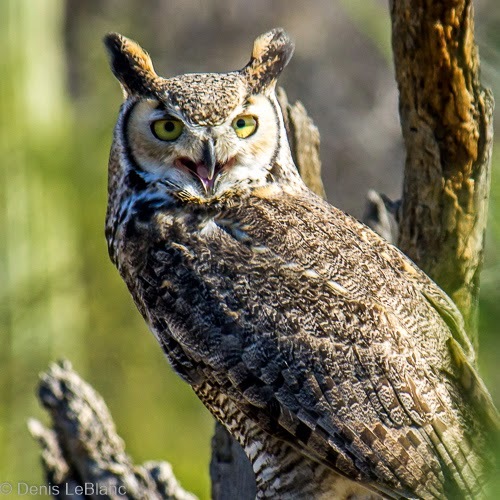 The highlight was the raptor show, which featured amazing owls and hawks flying back and forth right over our heads. 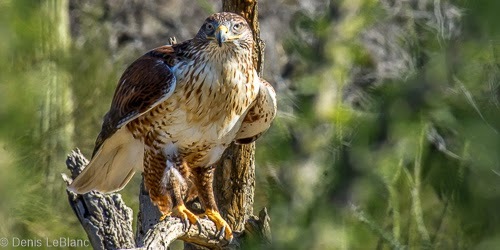 At one point, the trainer sent off a red-tailed hawk which circled and circled overhead, catching updrafts until it was about 1,500 feet up and a couple miles away. We could barely see this bird as a tiny dot on the clouds. Then, with a few waves of his arms, the trainer called the bird back to a nearby tree in literally a ten-second dive. It was one of the most amazing sights I have ever seen! Another great exhibit they had was a walk-in hummingbird aviary. 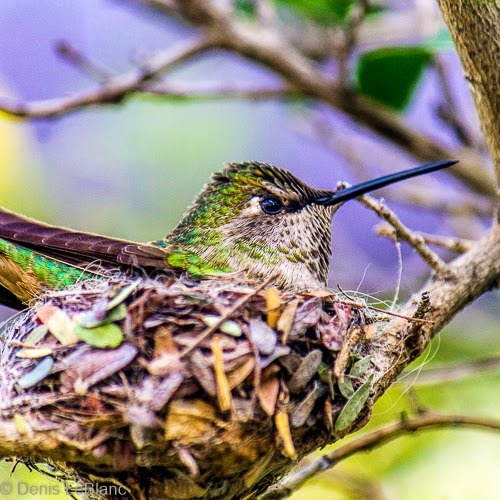 It was very fun to see these tiny birds up close and buzzing around our ears! 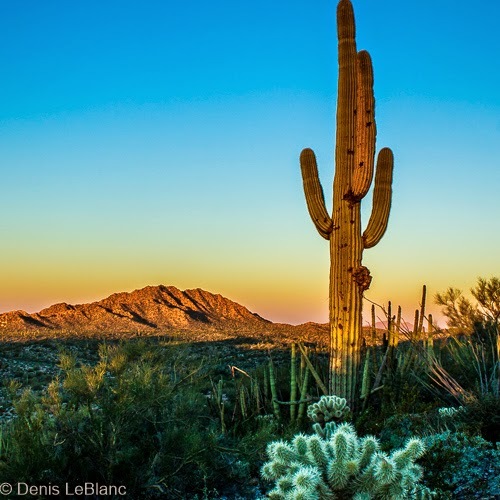 Reluctantly leaving the quiet and solitude of Organ Pipe NM, we headed for Tucson for a week. 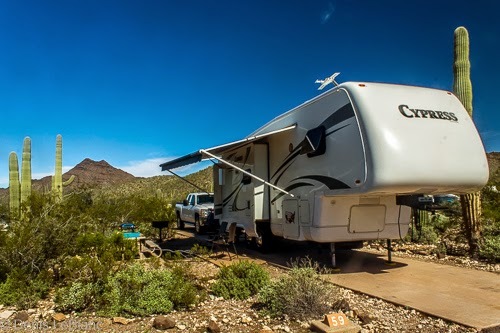 We camped again in the desert, but this time just over the pass was the huge sprawl of Tucson and surroundings. 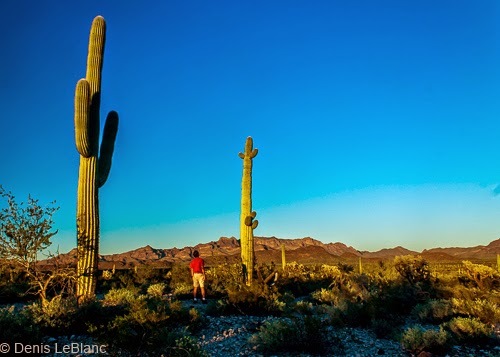 There was so much to do in Tucson, we felt that we had barely scratched the surface. 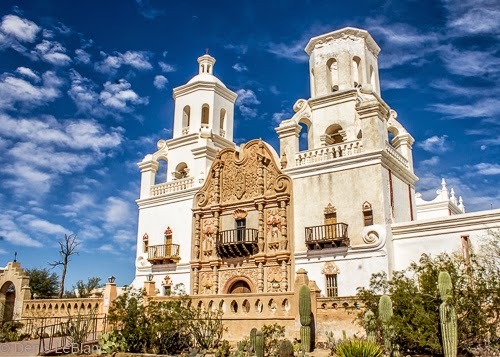 The first three days we visited the historic mission, a very interesting and beautiful cave and the historic town of Tombstone. 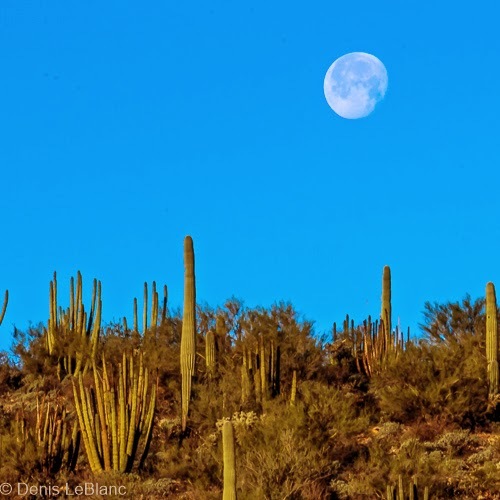 We also visited nearby Saguaro National Park and did a short hike. I'll get to everything else we did in the next post! 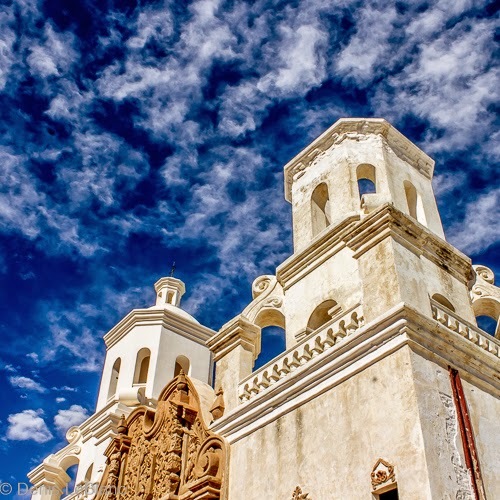 The oldest European building in Arizona is the San Xavier mission on the Tohono O'odham Indian reservation. 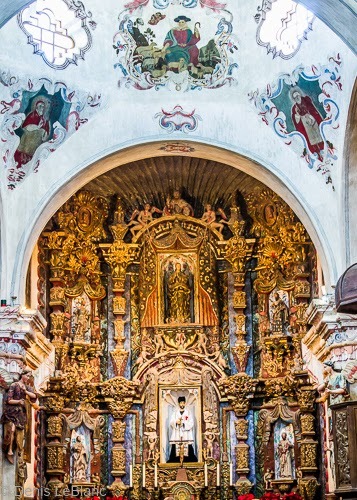 Built in 1797 on the site of the original mission church (built in 1692), this church is still an active Catholic church today. 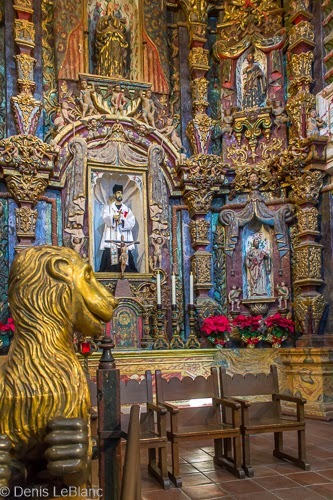 It has been beautifully restored inside and out. 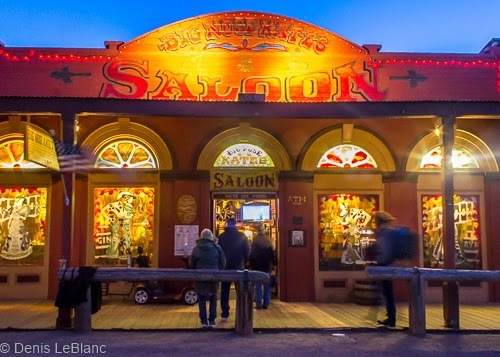 Leaving Kartchner we headed to Tombstone for a night tour and some dinner. When we arrived around 5 O'clock most things were closing up and we kind of had the place to ourselves. 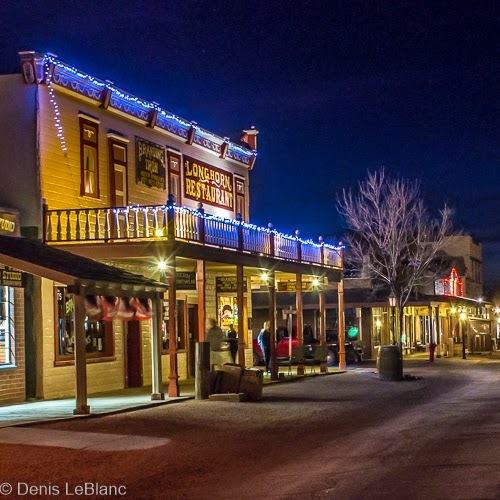 The old part of town is maintained as an Old West town and there is truly a lot of history here (not to mention movies done in or about Tombstone). I thought it looked coolest at night with most of the tourist gone! 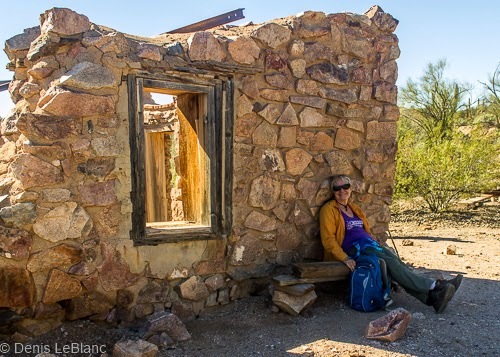 After this grueling day, we were in recovery mode the next day, but we did manage to visit and hike a bit in Saguaro National Park, just a few miles from our campground. 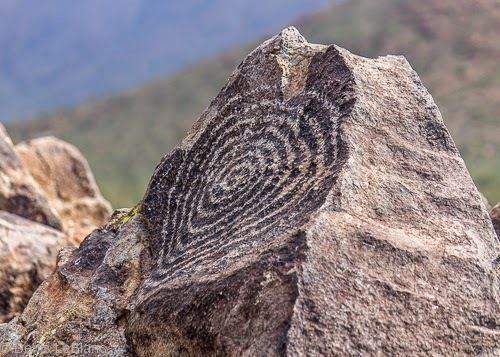 They have a site with nearly 1000 petroglyphs from the Hohokam people who had a thriving culture in the Sonoran desert from 750 to 1450. 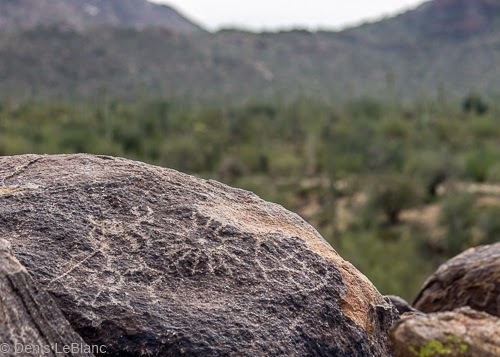 These petroglyphs are believed to be about 800 years old. 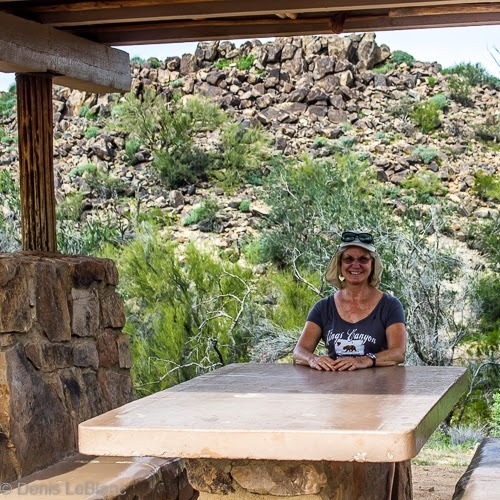 This picnic structure was built by the CCC in the 30's like so much of our National Park infrastructure. 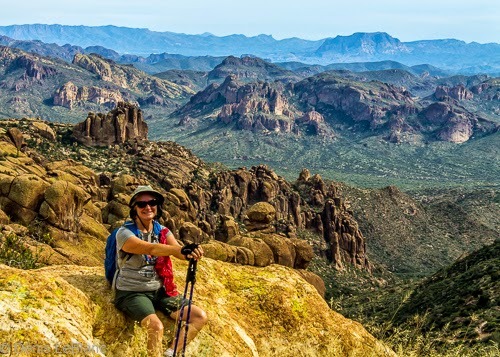 Down in far southern Arizona on the Mexican border is one of the most remote national parks in the states. 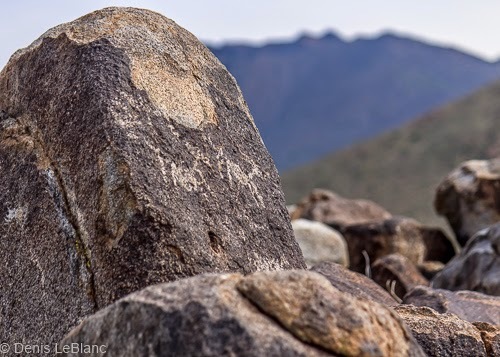 Created by Roosevelt in 1937, the park was still seeing mining a grazing activity until 95% of it was declared a wilderness area in 1977. 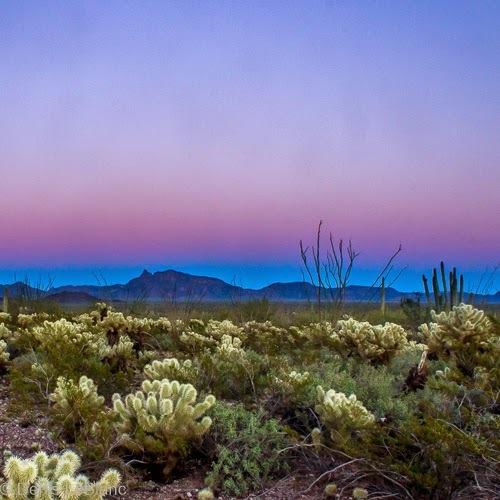 The effects of mining and grazing can still be seen all around the park, but it is returning to its natural state and was declared an International Biosphere Reserve by the United Nations in 1976 as an excellent example of the Sonoran desert ecosystem. 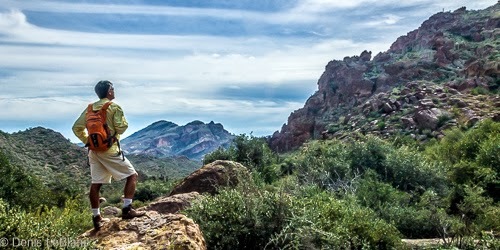 Much of the park was closed from 2003 to 2014 due to safety concerns around illegal smuggling activity after a park ranger was killed by smugglers in the desert. 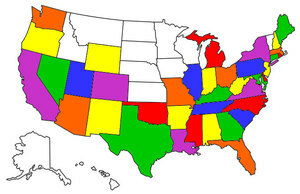 Now it is all open again and the ranger and Border Patrol presence is everywhere, so it is quite safe. 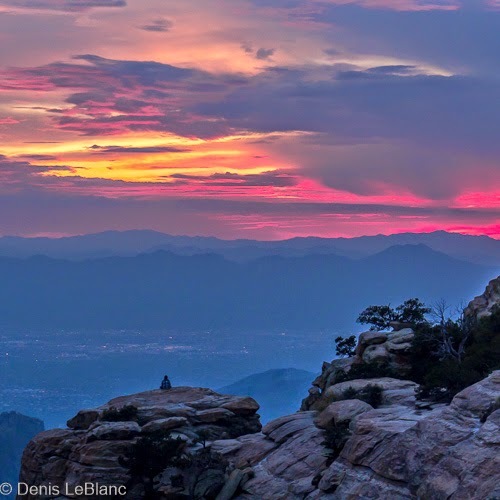 We camped here for a week and took advantage of the hiking and scenic drives in the park. 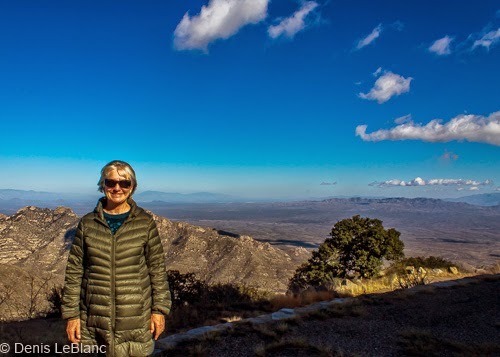 We took a ranger shuttle one day, driving right by the border fence and through some nasty dirt roads, to a trailhead where we could hike back 5 miles to the campground. This was a great way to experience the solitude and beauty of this remote place. I took a ton of pictures here, some of which are below. 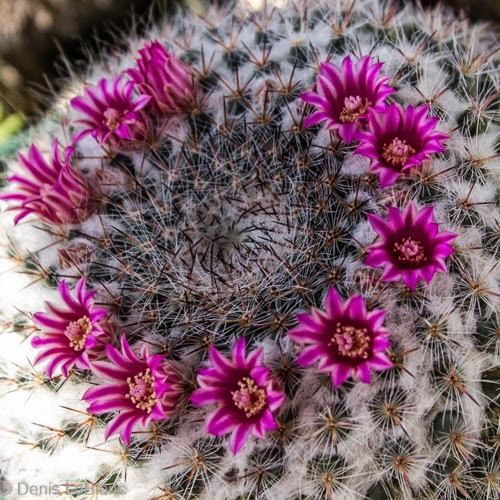 The Organ Pipe Cactus is common in Mexico, but only grows in a few places in the U.S. It grows to 15 feet tall and can live over 150 years. It blooms at night and is pollinated by one species of bat. 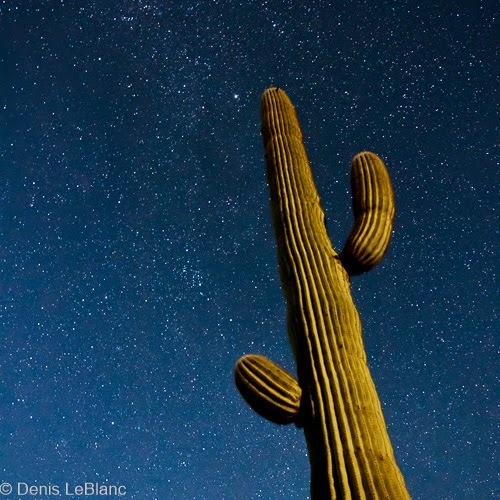 The Saguaro cactus is common everywhere in Arizona and has come to symbolize the state. 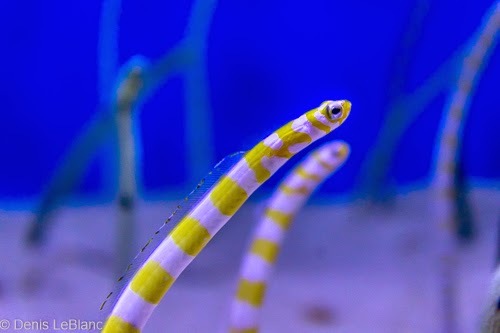 They can grow to 40 or more feet tall! 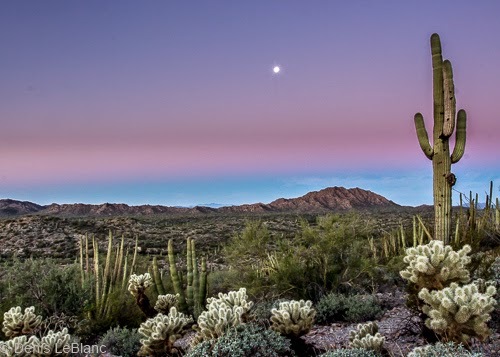 In the desert, the "Belt of Venus" is very obvious at sunrise and sunset. The blue band is the earth's shadow and the ping band above it is the sun's rays hitting the atmosphere above the shadow. 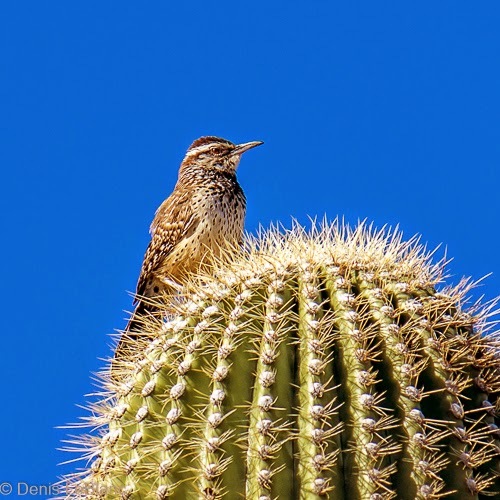 The cactus wren lives on and around cactus its whole life and somehow manages not to get stuck! 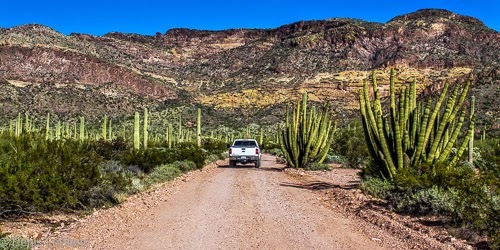 We took a 20-mile loop drive to the nearby Ajo mountains for a short hike and very beautiful desert scenery. 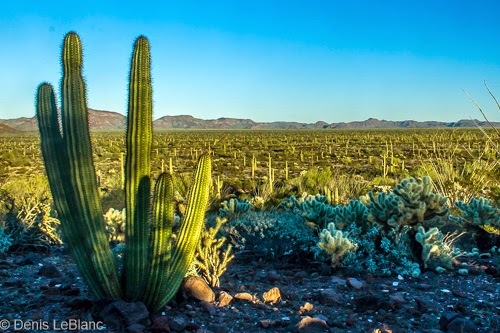 The Sonoran desert is the greenest and most lush desert in the world. 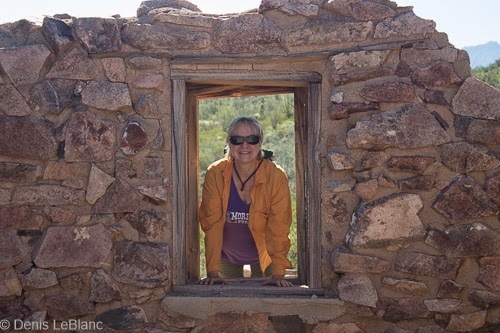 On our 5-mile hike, we visited the site of the Victoria Mine, which operated into the 70's. This is what is left of the mine store building. 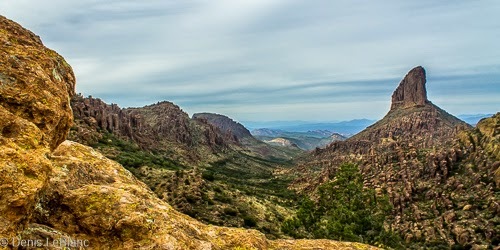 Our campground was a long way from anywhere, The mountains in this shot are in Mexico.